InTouch Technology builds sales and retention software just for health clubs. 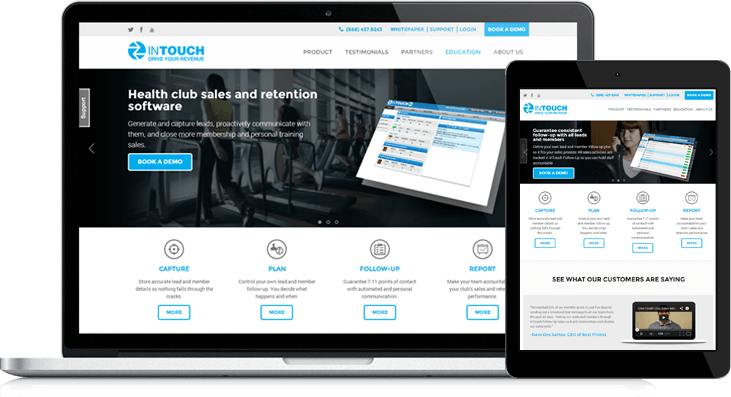 Currently over 800 fitness clubs worldwide use InTouch Technology software to proactively communicate with leads, personal training clients and members and drive their sales. InTouch Technology prides itself on helping fitness clubs across the world manage sales and customer retention with an easy to use platform. The website, however, didn't portray the brand in a desirable way. InTouch chose LyntonWeb to overhaul their user experience and get the most out of HubSpot in a quick timeline. The new designs emphasize the easy, user friendly interface of the platform and drive home the benefits with simple, full width templates.